So, now because of my earlier post, “Have You Heard About Shrinkage,” you’ve been thinking 0-1-2, 0-1-2, slow, slow, quick, quick (if you’ve ever taken a dance class with your wife you’ll get that one), and you are still a little confused. Most likely you got bored reading about the 0-1-2 rule I wrote about earlier and drifted off, but this is where it all comes together. Lumber basically comes in three categories of cuts, which refer to the angle of the growth rings in relation to the surface of the lumber; flatsawn, quartersawn, and riftsawn. A board can be any of these three or anywhere between these three, and since the growth rings form a circle, the category can even change within a board. That’s right, wider boards can have centers that are flatsawn while the outer edges are riftsawn and possibly quartersawn. That is why I push for an understanding of the cut of lumber and worry less about the name. Lumber cuts are determined from the end grain, not necessarily from the process that produced them. To the right are the three cuts in their most pure form (the three in the top right of the log diagram) and others that are thrown in for fun. The “fun” ones are to show that it doesn’t matter what process was used to get the lumber from the log (flatsawing, quartersawing, etc.) or its orientation in the log, it is the growth ring direction that counts. The growth rings of flatsawn lumber are parallel to the widest surface, while the growth rings of quartersawn lumber are perpendicular to the widest surface. The rings of riftsawn lumber are at a 45 degree angle. Remember, these refer to their purest forms and there are many cuts in between (as demonstrated by the “fun” names like Nifty Rifty Flatsawn). 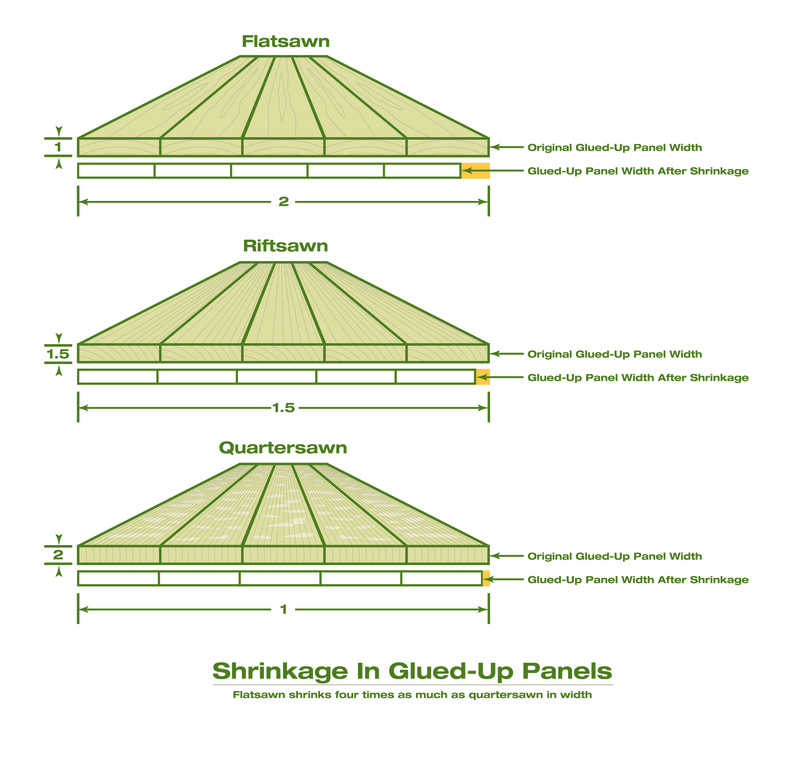 This illustration shows how little quartersawn lumber shrinks compared to other cuts. The next illustration shows the 0-1-2 rule in action. The three illustrations are table tops glued up from several pieces of wood. The first one is flatsawn lumber, the second is riftsawn, and the third is quartersawn. The numbers represent proportionally how much each piece will move in a given direction (remember that the length moves 0). In this case it is shown as shrinkage from a low-humidity environment, but it could also be expansion if the piece was stored in a high-humidity environment. Either way, the proportion of movement is the same. To make the proportions mean something, make them into fractions. Across the width, flatsawn lumber moves 2 over 1 when expressed as a fraction or 2/1, which simplifies to 2. Quartersawn moves 1 over 2 or 1/2. If you compare those two numbers (2 to 1/2), flatsawn moves four times as much as quartersawn across the width. If I didn’t just lose you, then you can see by looking at the numbers and the second illustration that quartersawn lumber has the least amount of movement across the width, while flatsawn has the most. This makes the quartersawn the more stable of the two as far as expansion and contraction goes. 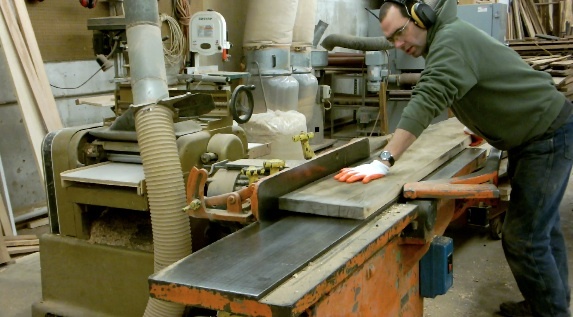 The other advantage to quartersawn lumber is its ability to stay flat. 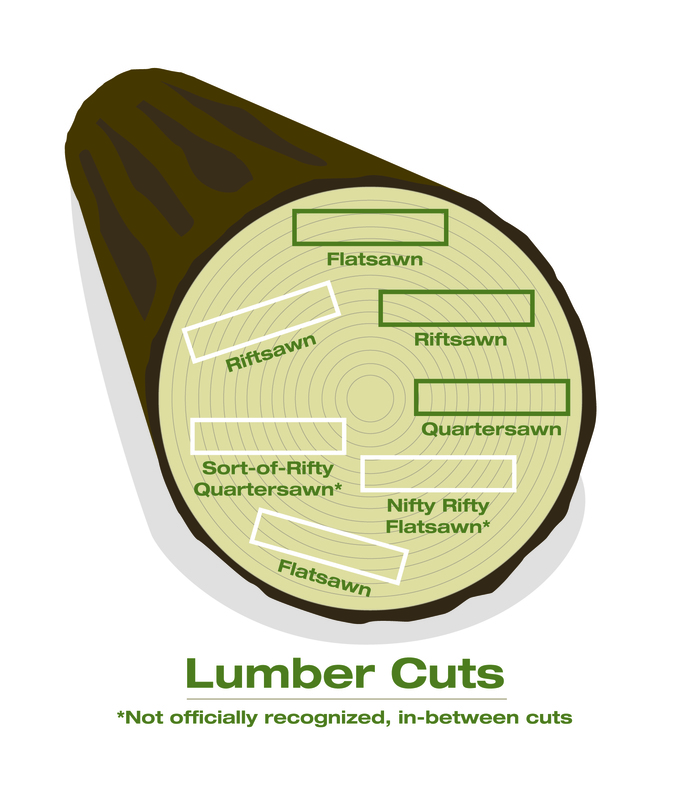 While flatsawn lumber has a propensity to cup, quartersawn lumber does not cup, and the 0-1-2 rule is the reason why. All of the heavy internal forces exerted on quartersawn lumber are in the thickness of the wood and going in only one direction, and they have little effect on the shape of the lumber. Those same forces on a flatsawn board are going across the entire face and in an arched trajectory. When these forces pull hard during shrinkage or push hard during expansion, they cause the lumber to take an arched shape that we call cup. Quartersawn lumber will stay flat and move the least amount when in service. However, it is not so stable that the wood movement can be ignored in construction. When joining two boards, any movement between them that is not proportionally the same and in the same direction must be addressed by allowing the wood to move. Remember the 0-1-2 rule, and look at the boards you are joining to see if the numbers match. It is as easy as 0-1-2. Glad you like it. I’ll try and make sure there is something to come back for. I love to work with quartersawn pin oak had good results ,why not?